Blog Are discus really that difficult to keep? To prolong the life of your filters, make sure you regularly maintain them. Make sure you remove, and clean any impeller shafts every month, and replace them every 12 months of operation. Any poly wool pads will need cleaning, or replacing every week for best effect. Check every day that your filters are working correctly. If you are unlucky to get a power cut, remember that the beneficial bacteria will die after four hours if any filters are turned off. Nitrate as low as possible but not so important as the first two. ORP 300 or higher the better as your oxygen levels will be better. Remember, high water temperatures = low oxygen rates. So plenty of aeration in the discus aquarium is desired by the inhabitants. The next secrete for success is, correct regular maintenance. You will need to do at least a minimum of 25% water changes every week, twice a week even better. So if this is not something you can’t do, think hard about keeping discus first. If you don’t do at least 25% changes every week, your discus will soon let you know. Discus next to a doorway, really? TWO, THE CORRECT LOCATION Something worth considering is forward planning of where you site and set up your discus tank. If the tank is sited where running children suddenly run past the tank out of nowhere, your discus may become unsettled, and frightened. I had a tank placed by a white glossed door some years ago. Where the bright white door was opened, the discus went mad, and shot around the tank as if launched from a catapult. Sunny days were even worse, with reflection of bright light shinning on the gloss paintwork reflecting into the tank, drove my discus insane. Wooden flooring and floorboards are also something worth thinking about. The vibration from just walking past a tank sited on wooden flooring can frighten any fish, not just discus. A friend of mine once used a wooden shed to set up a fish house and to breed angelfish. Every time anybody went into the shed, all the fish went berserk, and you found yourself creeping quietly in to have a look at the fish. After he moved his fish house and set the shed up on a solid concrete base, his angelfish bred and everything went great. Discus would have been exactly the same if placed in this situation. So we are beginning to see, not only discus, but also any kinds of fish really do need the correct conditions and criteria for success. Real plants in a discus tank look great, but please bare in mind that discus in the wild eat plant life. It has happened in the past that a discus keeper has spent a lot of money planting out a discus tank, and discus have cleared the tank and enjoyed an expensive meal. Others have used real plants and the discus have not touched them. But it is worth knowing that your precious plants could possibly disappear. Also if you do use real plants to aquascape your tank, suitable lighting will need to be used or the plants will die. This can be bright for discus and may make them hide away. So some floating plants would be appreciated for cover if you do venture down this road. THREE, CORRECT DISCUS DIET. Discus, unlike any other tropical fish needs careful feeding. 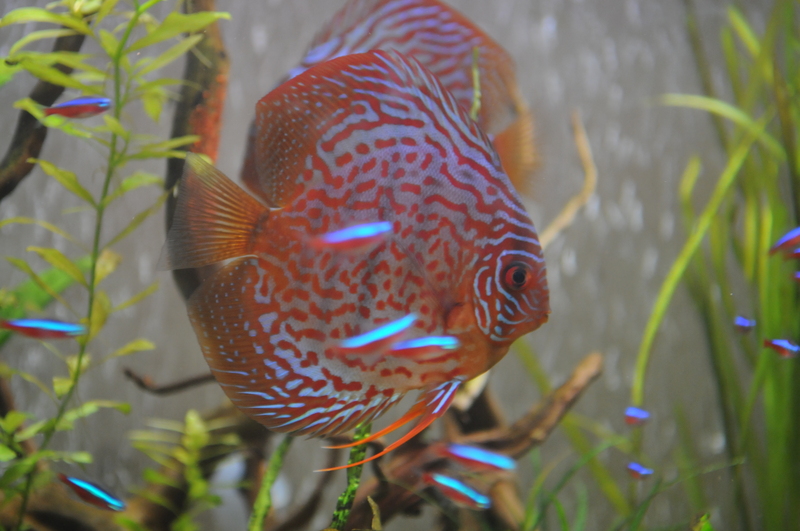 With the correct feeding discus should pose no problems. But having a different dietary tract to other fish, discus could be troublesome if given incorrect foods. Live foods can carry parasites, viruses or bacteria and pass on to discus and cause problems, with live tubiflex being the worse offender. Tubiflex worms are normally found living in drain systems and feed on the faeces deposited in them. Years ago this type of food was thought to be ideal for discus, soon after problems were found evident, and the fish was blamed as difficult to keep when it all went wrong. Some old books still sold today show pictures of live tubiflex worms hanging out of floating depositors, leading new discus keepers to thinking this is the correct way to feed discus. The only live foods I would trust is cultured white worm, and brine shrimp. Brine shrimp is a good live food for discus, because any pathogens found in the live brine shrimp food will not survive long in fresh water, and cause no problems in fresh water. Frozen Beefheart mix combinations from a trusted source such as the ones on this website and a brand I trust and offer for sale ourselves at Plymouth Discus Products are perfect to offer in with any discus diet. Yes, discus can be tricky at times to keep and accommodate. But if they are kept within their correct conditions and requirements, they are not as difficult to keep to any other fish. One last top tip to consider when keeping discus is not to over crowd them per space offered, or under crowd. They are ideal in numbers of six or more, but please allow ten gallons of aquarium water per fish. This rule can be broken and I do it all the time, and if you do, make sure you step up water changes in line to compensate. Discus like it hot, and by keeping them at 86f / 30c or slightly higher your discus should not suffer any problems with parasites, because the parasites will not tolerate or like the higher temperatures. Just before I leave you all for my first Blog, here are a few more little tips to keep you going until next time. 1) Test your discus water every week, and adjust water parameters if needed. 2) Make sure if you use power filters that the flow out put is not too fast. Discus having high-sided bodies will not like being blown around by fast flowing water. 3) Make sure you keep other discus compatible tank mates with your discus. I have seen Frontosa’s and even goldfish kept with discus in the past years, which are not ideal. Thanks for this wonderful article for discus beginner and them, who are really afraid to keep discus.